The focus of rapid product development in recent years as OEMs push to 5MW and beyond. 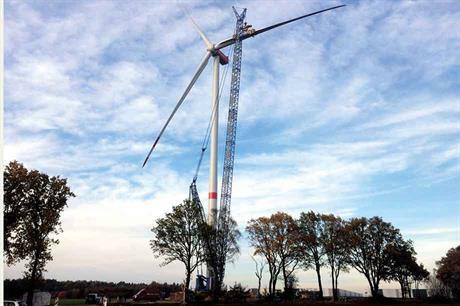 In August, less than a year after announcing its Delta4000 platform, the Nordex Group installed an N149/4.0-4.5MW prototype, with a second following in November. This is a major achievement, which spearheads the competition in the race for new onshore turbines with supersize rotors. Nordex has already received orders for 150 units. The N149 has flexible power ratings of 4.0-4.5MW for optimal deployment in different operating environments, including those occurring within the same large wind farms. Since the introduction of its uprated 3.6MW Delta platform, Nordex has certified all turbines for IEC S sites. This allows designs to be more "on point" and LCOE-efficient, and offers fresh opportunities such as various optimised operating modes that maximise annual energy production under specific site conditions, such as high winds with low turbulence, or low winds with high turbulence. Delta4000 nacelle dimensions are unchanged from the Delta platform launched in 2013, despite the higher loads, and retain the proven three-point gearbox support and DFIG at 660V level, allowing extended use of existing supply chains. On the Delta4000, the power-electronic converter and MV-transformer have been moved inside the nacelle to curb electric power loss during transport down the tower, a valuable benefit with higher towers and power ratings. The lightweight in-house NR74.5 blade development benefited from Nordex Blade Technology Centre ApS’s (formerly SSP) know-how and experience, reflected in the high-performance blade-root joint, high-capacity moulds, blade production ramp-up and workforce optimisation. Rated 4.0MW but with a power mode option to take it up to 4.2MW, the V150-4.2MW is a technology evolution of the V136-3.45MW and, before that, the V112-3.0MW of 2010. All feature common nacelle dimensions with a non-integrated high-speed drivetrain and three-point gearbox support, but several main components have been strengthened to match the higher rating and loading. The new 73.7-metre rotor blade is again the Vestas structural-shell type, incorporating carbon, and is quiet in operation at 104.9dB(A). For a project in Finland, five V150-4.2MW turbines will be installed on a 175-metre cable-supported tower. Vestas has more than 1GW of firm V150 orders, with production ramp-up expected in the first half of 2019. The uprated 4.0MW E-126 EP3 with a 127-metre rotor diameter is the first model in Enercon’s new turbine platform, and part of an ambitious and radical technological change of direction. The prototype was installed in August 2018, with commercial production following immediately. Visually, it is a departure from Enercon’s iconic egg-shaped nacelle and unusual blade design with wide inner-blade spoiler and winglets. But the new turbine is easier and cheaper to manufacture, transport, install and service. The EP3’s technology is characterised by a huge drop in head mass and a switch to a three-module configuration (hub, generator and nacelle back-end). Each module is pre-manufactured and pre-tested inside the factory. The turbine features new single-piece blades.